Being a huge ramen fan myself, I had to try Menya Musashi since I’ve heard good reviews about them. They have four more brances besides Star Vista, namely Ion, Raffles City Shopping Centre, Thomson Plaza and Vivocity. Basic white char siew ramen. What’s unique about this ramen franchise? Their soup bases comes in three different types — white, red and black. White is the more conventional type of soup base that we usually eat elsewhere, while red is pretty obvious that it’s spicy. I haven’t quite figured out what’s black. Their soups are made from boiling pork bones over long hours, so expect to slurp some really thick concoction. 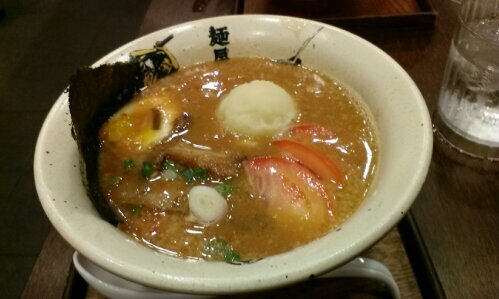 Tomato white char siew ramen. Pretty much an outstanding feature is that they have duck meat as one of the ramen toppings on their menu. I didn’t get to try the duck meat, but the char siew and noodles that I tried were above average, pretty yummy I would say. They do offer what they call Tsukemen, where you would eat the noodles like how you’d usually eat your cold soba, except that it’s a bowl of soup instead. Again, didn’t try this cos it didn’t look very promising. Or maybe I should have, because I would usually slurp my ramen down to the very last chopped spring onion. Not for Menya. I didn’t even finish half my bowl. That’s how bad it is. The worst ramen I have ever eaten. Even buying those frozen fresh ramen packs at $5 per pack is tons nicer than this. Really. And the tomato, which should give the soup an added boost of sweetness, failed to save the day. Well, all hope is not lost though. 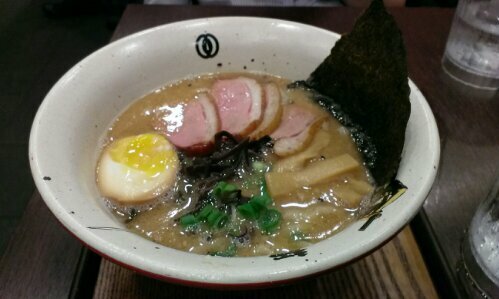 A couple of my friends have told me that Menya is particularly bad at Star Vista only (corroboration: the above sentiments don’t just belong to me alone); the rest of the branches are pretty awesome. I guess, I shall give it a second chance when I visit the other places. Do wait for it, although it may take quite a while. Website here if you wanna check this place out. Reminder: I really disliked the one at Star Vista.